Over 150 businesses in leased and owned facilities in Moreland that have already seized the opportunity to reduce their costs with solar. Commercial solar capacity has doubled in Victoria this past year. With the cost of solar approaching $1 per watt and rates of return over 20% p.a. solar is fast becoming business as usual in Brunswick and beyond. 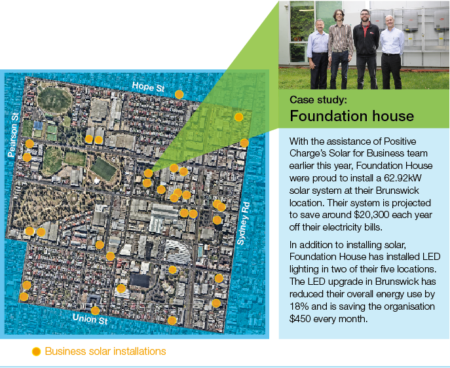 We have helped several businesses across Brunswick go solar and are thrilled to see many others putting solar on their roof – all the yellow dots in the picture are businesses with solar! It’s great to see these businesses reducing their electricity costs and improving their profitability and financial sustainability, while doing their bit for our planet. Moreland Energy Foundation’s Positive Charge team can support your business through the sometimes tricky process of going solar. We can help you obtain obligation free quotes from a panel of carefully vetted suppliers as well as provide a summary to help you understand the quotes, finance options and support available. 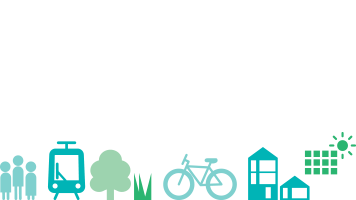 You may be eligible for no upfront cost financing from Moreland City Council. If you’re a Moreland based business, not-for-profit, school, childcare centre or community group email daniel@mefl.com.au to arrange your obligation free quotes.